St Helens floats on the skyline with the look of a cake whose meringue has slipped off into billowy piles around its base. Hummingbirds dot the inner distance – playful-aggressive specks on the outer magnificence. Sliding meringue. A disparaging experience, eliciting feelings of helplessness and disbelief, par for the course for a new pastry chef, I suppose. There’s no shoring it up when it has insufficient structure. Had forgotten to use a hard meringue (with a larger ratio of sugar to egg whites) to frost the Salted Caramel Chocolate Torte. The oversight was a Baking 101 moment. 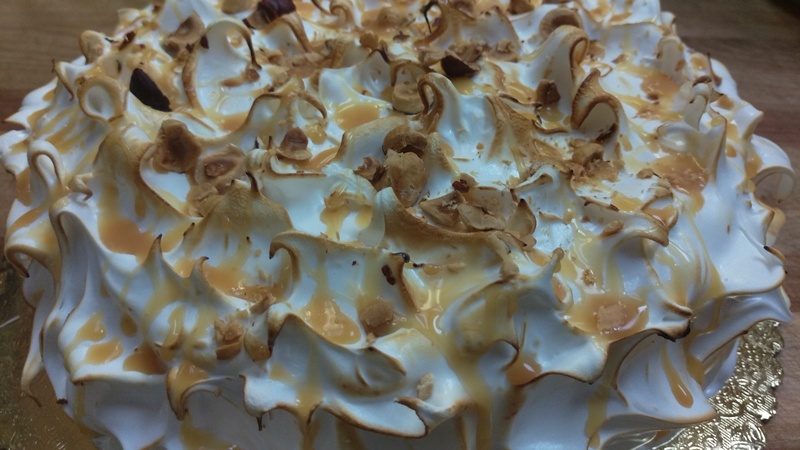 I used a soft meringue, of course, as the foundation for the Italian buttercream flavored with salted caramel sauce that graces the three chocolate layers. Fluffy, elegant, a thing of beauty. Carbon-torched peaks and edges, a wickedly fun finishing technique. Drizzles and puddles of salted caramel sauce and crushed toasted hazelnuts tossed with abandon on the snow-capped torte. Dessert creation isn’t about perfection, although that quality is certainly inherent in a pastry chef’s personality. It’s not about speed, but speed arises naturally through rote… developing a feel for the product, its behavior, its viability. But, hit the sweet spot of knowledge and technique, and an endorphin kicks in that can only be likened to that delicious reaction to a beautiful landscape. Even if the clouds have slid off the mountain.